And now at Imbolc, I realize I missed this one in the craziness of my life as a caregiver. Such an exquisite new moon photo-and I thought for sure that was a whale. I hope South Africa has a better government in the future with more trusted leaders. Of course, I hope the same for my insanely messed up country. It’s hard to know how we’re going to get out of this mess. Wishing you and your family the very best of the festive season, Susan. Those are some gorgeous clicks!! Thanks Shilpa! All best wishes to you and family too! A lovely optimistic post, Susan. I hope things will start to improve and we will not have to immigrate but we will see what 2018 brings. Thanks Robbie for coming by. I’m not madly optimistic 😀 If I had young children I’d probably also be thinking seriously of emigrating. Let’s hope that things improve and that we don’t lose you. Love your final quote, as I sit here snuggled under blankets in the Northern hemisphere, on a very cold morning. I wish you peace for your country, and mine, and for the world. For people to respect each other, to lose the need for power and control. I wish you health and success in the New Year, and many happy times with your family and friends. I had to let you know! I hadn’t really noted the title when I bought the book. Was just so pleased to see a book of hers I hadn’t read. We can only hope and pray that all that you say in your lovely comment will come to pass. Hi Susan, Thank you for your lovely warm greetings from your holiday with family. I love the card from you all. Wishing you all that you wish for – peace is a great place to start – Have a wonderful Christmas and a happy new year! See you in 2018! Hi Norah, thanks for coming by. All warm and merry Christmas greetings to you and family. May Peace reign. Happy Solstice (that top photo is amazing! ), and Merry Christmas to you and yours. I hope you enjoyed your long day filled with warmth in the air and family love. I hope the new government is a change for the better. Yes that’s the two susans book! The other is mine. All good and warm festive greetings to you and family. Glad to read your post susan, and wishing you and your family a happy christmas,and a great 2018. The card is beautiful and attractive, appreciate your son for this card, the first Picture above is beautiful, thanks for your informative post. Its always a pleasure to read all the post, and thanks for being an inspiration throughout the year, and may blessings follow you all the days of your life:) stay blessed. I am happy to hear that you are reunited with your family and enjoying the beach which reminds me that it is summer in other places on our planet. Also, it’s heartening to hear that your government may be finding its way toward a new direction. Tell Mike I think his cartoon greeting is super duper. 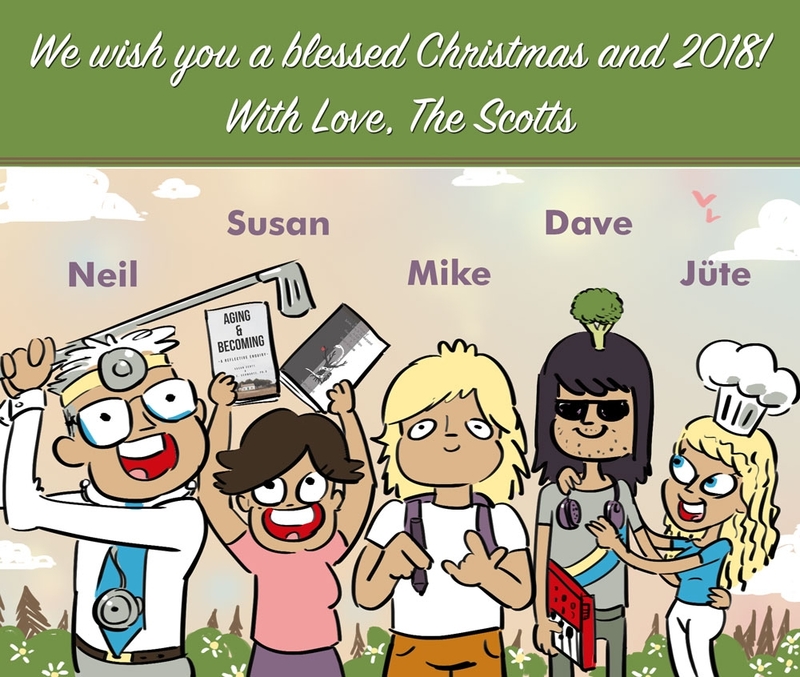 All the best to the Scott family in the new year! Thanks Marian so much! We wait to see what will transpire with the new ANC leadership. I will certainly tell Mike when I see him later, thank you. All best wishes to you and family and for 2018! The grandchildren may enjoy Dave’s video in case you wonder about the broccoli on top of his head. It’s quite funny; he made it about 5 years ago. The Kiffness – The Broccoli Song – YouTube – unsure if this link will work, but it would just be getting onto youtube and typing in the kiffness and accessing the broccoli song ..
All blessings to you and your family this Christmas, Susan. Thank you Sue, and to you and yours – and Ani of course! Looking forward to hearing your tales Hilary! I wish I automatically received your blog posts. No way Susan, you’ve added a like button? I’m sooo happy. i can start dropping likes on you! Merry Christmas and may the New Year bring you everything your heart desire. A very happy Christmas/Solstice to you Susan and to your family from your knowing and envying Plet friend! Talking of boils building rather than being lanced we face the hatred and antipathy here with the factions supporting and hating Brexit in equal measure.Half the country is spitting at the other half. It reminds me of times long gone in SA. I was writing about Trevor Huddleston the other day and it brought it all back so vividly.Hope CR has the courage he is going to need! Thank you Phi for your Christmas Solstice wishes. I wish that for you and yours too. Best Blessings for you and your lovely family. Merriest of holidays to you, Susan. Love the card–that is one talented son! Thanks Jacqui! I’ll tell him! Merry merry to you! Dear Susan, Happy Solstice Day! Oh my Goddess, talk about the tension of the opposites … with the fat cat and the rescue cat within your stories … this is why I enjoy Jungian thought (especially MLVF!) with its symbolism and mythology so much! If you haven’t already read Von Franz’s book, “The Cat” I would highly recommend it. Totally love the Camus quote! Curiously, and in many ways, I can relate to my own “poison” (metaphorically!) representing that of a boil … one that I began to slowly lance myself at mid-life. Only then did the poison begin to truly ebb away. And as for beneath the wound … hope, beauty and promise. The healing (I sincerely hope!) will continue. The smiling moon of your top image fits perfectly. What JOY to read of your family festive gathering in the beautiful Plettenberg Bay, to see your photographs and Mike’s fantastic Christmas card! A time to stand still and together with the people and places, and faces we love. Time to give thanks for all that we have. I also pray for a fresh direction for your beloved homeland. Warm and wild blessings to you, Deborah. Deborah, this is an excellent example of my learning from the comments such as you – when you say eg about the rescue cat and the fat cats – I truly did not make that connection, so a thank you for spotting it! I don’t know about MLVF’s The Cat … I will search this out pronto. Yes, I believe that boils fester for a long time, and take a long, long time from time of lancing to remove all that is ‘poison’ – and then does the healing begin, and continue … as in ancestors, your lovely piece of writing yesterday. Re: Cats! Oh I just love it when that sort of connection happens! “The Cat” book by MLVF is totally awesome. Have a read of the Amazon reviews, see what you think. Yes, that’s so true about those metaphorical and those literal “boils” … Ha-ha! I’ll write a poem about mine someday! Just while I think about it – I read Isaac Bashevis Singer’s ‘The Slave’ just recently. A powerful book that leaves no stone unturned. Set in Poland in the 17th C. I think you would love it. I checked out the book on Amazon, but not yet the reviews which I will still do and see if there’s anywhere that it’s on kindle. Or if there are papers on it. I wonder if The Cat is in her book on fairy tales .. which is at home in Johannesburg! I finished yesterday Isaac Bashevis Singer’s ‘The Slave’ set in 17th C Poland. He leaves no stone unturned. I think you would love it! Merry Christmas Sue – I have so enjoyed your blog. I hope the solstice brings serenity and a change for the better for The Beloved Country – that it so deserves. Peace and love to all the family. Here’s to a wonderful winter and excellent 2018! Happy winter to you Beth and a wonderful 2018 too!